I know you’re into peace and all that, but you stick that thing out there and go to work. I would count myself as something of a Roland Emmerich apologist. As dumb as his movies often (always) are, they usually come armed with a self-conscious glee (who can forget the limo outrunning the San Andreas fault in 2012?) And he’s a good, clean action director. You can tell what’s going on in his pictures, and such a skill set needs to be applauded. That said, I don’t have a whole lot of time for his biggest hit Independence Day. Conversely, Anonymous is a lot fun for the manner in which it strives to be smart but ends up exactly like standard Emmerich fare. 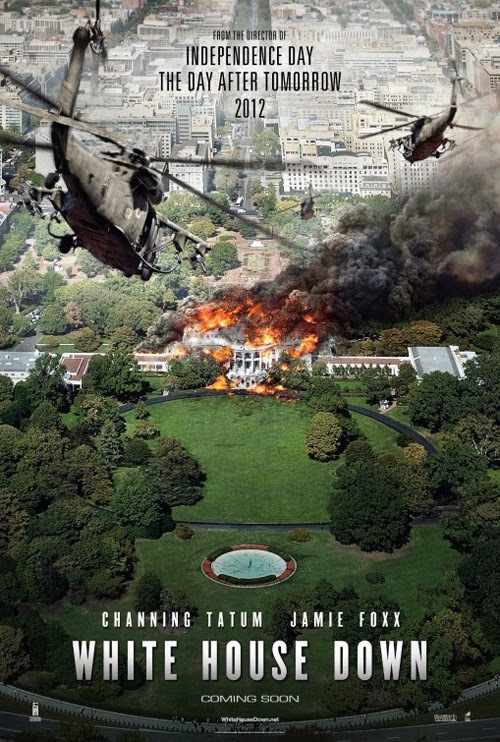 White House Down underwhelmed at the box office, and has dutifully received its share of brickbats, but I found it to be hugely enjoyable. It only really stumbles during the final leg, where its indebtedness to the pictures it shamelessly copies becomes overly mechanical. As a consequence, the whacky sense of humour previously on display takes a back seat to frying the bigger fish of tying up the plot. White House Down is hugely beholden to the first Die Hard. The only reason this couldn’t have been a part of that series’ canon, if Bald Bruce had replaced Channing Tatum, is that in set up and structure WHD is so similar audiences would surely have cried foul. Well, they cried foul anyway; for Emmerich this was an unexpected failure, the movie’s thunder having been stolen by the considerably cheaper, considerably nastier, and considerably more xenophobic Olympus Has Fallen (not that Olympus doesn’t have its visceral merits, mostly on the level of not pulling any of its punches in order to be as incorrect and excessive as possible; on the violence front White House Down is very much Live Free or Die Hard, rather than the John McTiernan original). It was even cited by Sony as a factor in its less than stellar performance for that quarter of 2013. Emmerich’s movie establishes itself in identikit fashion, confident that it’s better to copy a master than flail about incoherently. So Tatum’s cop John Cale, who has applied for President Sawyer’s (Jamie Foxx) Secret Service detail but been unceremoniously turned down, finds himself at the White House by mistake. Who knew? Cale is a bit of a slob, and likes to wear a wife beater (like John McClane). He has a troubled home life (like McClane), although in this case he has separated from his other half with some finality. But he has a daughter (like McClane) whom he is trying to connect with (Joey King as Emily Cale is actually more akin to Willis’ daughter in Last Boy Scout, without the perma-foul-mouth; they even bear a slight resemblance to each other). As with Die Hard, a member of Cale’s family falls into the clutches of the terrorists, and Cale must do all he can to rescue her. Like Die Hard, her identity remains a secret until a crucial moment when the bad guys can use it as leverage. Tatum’s obviously a lot beefier than Bruce ever was, and as a result we’re never buying him quite as the ordinary guy in an extraordinary situation (he’s also a decorated war veteran, as is always the case with any hero with fighting skills in a Hollywood movie these days; the number who come out these Middle Eastern conflicts pumped to the max and with no signs of PTSD is extraordinary). This is made up for in part by presenting Cale as the underdog in terms of class and education. He has (war torn) street smarts, but lacks honours degrees and etiquette. He also has a quick sense of humour. Tatum is very funny in White House Down; he isn’t an actor I’d have pegged as a natural comedy guy prior to 21 Jump Street and he’s not sharp the way Willis was (20 years ago), but he has that self-deprecating non- high-IQ-threatening quality Mark Wahlberg has also made a virtue. A line like “He’s probably some schmuck from one of the tours” is the kind of underestimation of an opponent we previously saw with Hans Gruber. How much of all this was improvised with co-star Foxx I don’t know, as writer James Vanderbilt is another guy I didn’t see as much of gut buster (although Welcome to the Jungle has its moments). His inability not to smart mouth is very winning (“I’m sorry, I just looked at him” he responds to interviewer and old friend Carol Finnerty – Maggie Gyllenhaal – on being told not to look at Special Agent Todd). Cale’s relationship with his daughter is also quite mirthsome; there’s been a string of child performers in movies lately who have managed not to irritate or come across as horrifically precocious (Iron Man Three being the most obvious other recent example) and King’s White House-obsessive (she has read on Wikileaks that the Presidential Emergency Control Centre is under the East Wing, asks the President a comprehensive policy question that he has to smooth his way out of). Like so much here, everything rests or falls on the interplay, so when Cale and daughter are separated (and later too Sawyer and Cale) the fun factor diminishes (Willis on his own can joke away, of course). Consequently, Emmerich is reduced to cheap yuks such as Emily waving the presidential flag on the White House lawn in slow motion in an attempt to stave off an incoming air strike. You can tell he’s relishing the OTT-ness of it all, in a manner that is never entirely clear with a Michael Bay movie, but it’s not really all that clever. Second Observer: He has a rocket launcher. Kellerman: That’s something you don’t see everyday. A quick summary of the rest of the overt Die Hard-isms. A whole lot of time is spent in White House lift shaft, both in and atop the lift. Cale dispatches a friend of the main heavy (Josh Lucas) early on, eliciting Lucas’ vow of vengeance and an inevitable uber-punch-up. A whole sequence is set on the roof of Nakatomi Plaza the White House which includes assorted exploding helicopters. Any number of long shots feature (news) reactions as huge explosions announce bad guy altercations with Cale. The media reportage is directly responsible for the villains sussing out Cale’s family presence (while it has its moments, the news spoofing isn’t nearly as witty as Die Hard’s, unfortunately). There’s a tech genius (Jimmi Simpson) who plays Beethoven as he crashes the White House computer codes. The need to allow enough time to do this finds the villains creating false scenarios and plans to distract the negotiators. On the negotiation side are a number of hard-asses who repeatedly miss the bleeding point (Lance Reddick, not nearly as good value as Agent Johnson and Special Agent Johnson). In an obvious reversal (“Whoever said we were terrorists?”) the apparent common criminals (they want $400m from the Federal Reserve) are actually revealed as followers of a cause (this is the least convincing aspect, at least the part that relates to character motivation). There’s also a mild-mannered fellow who proves he’s a real man by killing someone (Nicolas Wright as Donnie the Guide). The fact that Donnie is incited to violence not by feelings of inadequacy but apoplexy at the desecration of priceless art treasures (“Stop killing my White House!”) suggests that Emmerich is probably in on the machismo joke, and how some of Die Hard’s more conservative leanings mar an otherwise perfect action movie (there’s that, and McClane’s wife returning to a husband who re-establishes himself as the rightful head of the family; we can at least thank with a Vengeance for remedying that). If White House Down is expectedly l,asks subtlety in its political perspective, this is both a good and bad thing. At least it picks on a deserving villain and a decidedly homegrown menace. One might read a number of cute positions beneath the apparently blithe cut-and-paste machinations. President Sawyer, a Democrat premier making choices unpopular with his party and beyond, represents the leader Obama promised to be but most definitely was not (“I want to make a difference” he asserts, something Obama singularly failed to do except on a negative scale). The charitable interpretation of the real US President’s rein in office would be that any intentions he had to make a difference were consistently undermined and threatened as soon as he was enabled (this certainly is a defensive conspiracy theory in the debate on how it could all go so wrong with a President who has succeeded only in building on Bush Jr’s legacy, rather than retreating from it). Could Emmerich be warming to his labyrinthine plots in his new post-Anonymous period? He’s already established there were space aliens about 10,000 BC after all. President Sawyer plans to remove all troops from the Middle East, so incurring the wrath of the military-industrial complex. “Those guys who run those corporations have been in bed with these radical regimes for years” suggests Sawyer. They wish to keep the cycle of war going. Given Emmerich’s finger pointing, I’m not sure he’s saying it’s a good thing when Sawyer observes they don’t need troops out there now they’ve got drones; he’s noting how self-perpetuating the whole military machine is. “They think they own the system,” he continues. There’s even some play with the argument over Iran’s nuclear capability (“There were no nuclear weapons in Iran” says Sawyer; “But there will be” replies James Woods’ Head of the Presidential Detail Walker, poised to let loose the missiles). The wrap-up Scooby Doo unveiling sets it all out in the open even more directly; “You did all this to keep your buddies in the defence industry happy”. It’s little wonder some have accused WHD of leftist propaganda, although it shouldn’t escape their attention that, as much as Emmerich and Vanderbilt are playing with Foxx as Obama (Nicorette gum) and neo-Nazi lunatics (in particular Kevin Rankin’s “right wing sociopath” Killick), the focus is more particularly on the capitalist machine. The terrorists who invade the White House are mercenaries, soldiers of fortune, and their only mistake is not to recognise that there is a bigger cash prize than their trifling theft can conceive. It’s a neat incidental gag that Cale is/was a Republican (“You didn’t vote for me?” replies Sawyer) and that the President is reduced to a conspiracy-theorist in a plot much greater than himself. In Emmerich’s world POTUS has no real power (how long will he last after the end credits? It’s just as well this wasn’t a big enough hit to guarantee a sequel). Of course, the convoluted plot machinations are a bit too much to swallow so the pull back from the breezy humour of the first two thirds casts a harsher light on them. The sequence of events requiring Richard Jenkins’ true mastermind to take charge (not that much of a shock, as these movies always have to overdo the twists to the extent that the twist would be not to have a twist) is way over the other side of unlikely. Meanwhile James Woods, finally looking the way Sergio Leone intended in Once Upon a Time in America, is squeezed into an incontinent backstory about his son who died in Afghanistan; that one just causes indigestion (like he could have kept having a tumour secret). Woods is always great value and he has some decent lines (“Apparently we’re all Arabs. Cake?”). Unfortunately he has an uphill struggle making his character’s motives convincing (it’s a recognisable failure of most action movies that, whatever the pedigree of the actor cast as the villain, they aren’t furnished with a truly memorable character). On the other hand, there’s a great scene where his bid for revenge is endorsed by the wife expected to persuade him from pushing the world over the brink. At times Emmerich’s shorthand is so unadulterated it reaches almost sublime heights (“Sir, the stock market’s collapsing!”), it’s a shame that, as solidly made as WHD is, it’s inferior to much of his larger scale work (not that this doesn’t have scale, but it’s all relative). The action sequences are occasionally choppy, perhaps underlining that he hasn’t made a down-and-dirty action picture since Universal Soldier (I’m not counting The Patriot). And, while he just about makes it all fly in PG-13 hosiery, you wish he wasn’t restricted in terms of the violence (not that he’s particularly one for gore anyway). More surprising is that the special effects are at times very clearly not up to par. That was the case with Olympus Has Fallen also, but it cost less than half as much. Emmerich has always been reliable at very least for his mastery with integrating effects, so the sight of obviously CGI helicopters and the pixelated altercations on the White House roof come as a particular disappointment. White House Down is a riot for the first two-thirds, revelling in its own stupidity and cheesiness, carried along by a couple of likable leads, expertly raising the stakes and assured that everyone is in on the joke. It’s only when the buddies are separated and necessity of following the plot takes over that it loses its edge. For a movie stealing so liberally from Die Hard it does so remarkably well; if the further adventures of John McClane had even half this verve and brio, and sheer charm and gusto, that series wouldn’t have hit such a terminal brickwall.